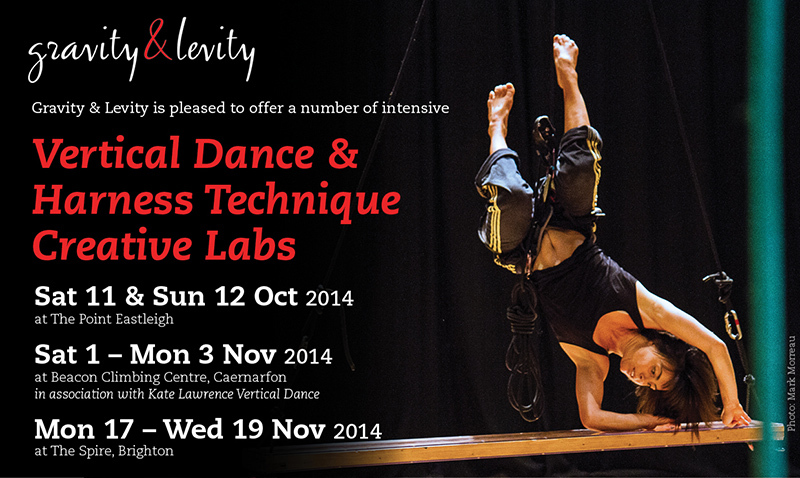 Gravity & Levity is delighted to be offering intensive 2-day and 3-day Creative Labs in Vertical Dance and Harness Technique. Drawing on material devised for the company’s current production, Rites of War, these workshops are led by Artistic Director Lindsey Butcher with members of the company and are designed for those with some prior experience of aerial or dance. Working in sit (climbing) harnesses, we’ll offer guidance for working in solos and duets, feeding in ideas and information for your own discovery as the sessions progress. As you explore movement ideas, we will help you develop bodily control and focus on spatial awareness. You’ll gain an insight into aerial dance practice and how to make devised work for the stage where different elements are at play, including the constraints and freedom offered by the rigging, aerial equipment and set design. A 2-day weekend workshop in advance of the company’s performances of Rites of War. A 3-day intensive workshop in association with Kate Lawrence Vertical Dance. A 3-day intensive workshop which includes splicing and knotting know-how sessions. Bookings open from October 6th 2014.